The ciliary muscles can be divided in three groups, based on insertion and origin., see previous picture. 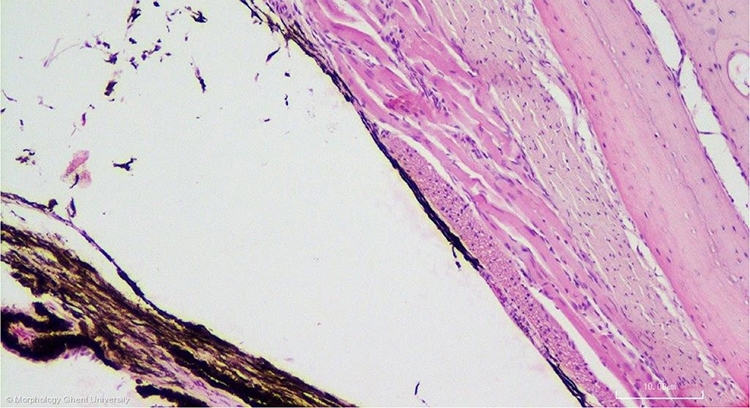 On the micrograph above, part of the anterior muscle (m. ciliaris anterior) or Cramptonâ€™s muscle and part of the internal muscle or MÃ¼llerâ€™s muscle are shown. The latter extends from the baseplate of the ciliary body to the inner lamellae of the cornea and plays a role in corneal and lenticular contraction and anterior movement of the lens.